The valley is made up of the Kathmandu District, Lalitpur District and Bhaktapur District covering an area of 220 square miles(almost the area of Singapore). The valley consists of the municipal areas of Kathmandu Metropolitan City, Lalitpur Sub-metropolitan City, Bhaktapur municipality, Kirtipur Municipality and Madhyapur Thimi Municipality; the remaining area is made up of a number of Village Development Committees. The valley is a cultural and political hub of Nepal. 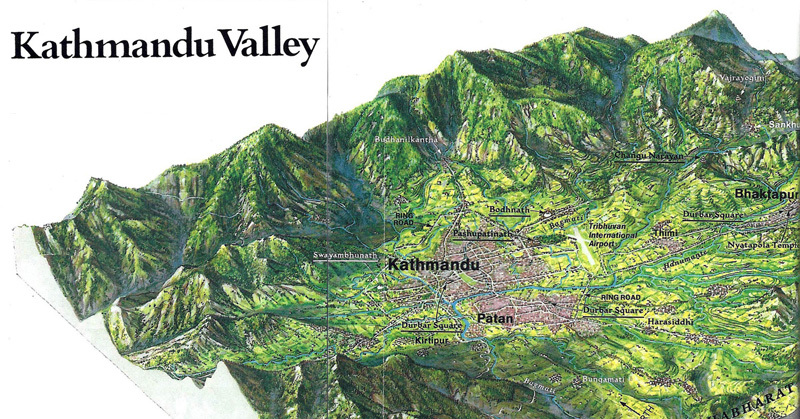 The Kathmandu valley was accorded the status of a World Heritage Site by UNESCO in the year 1979. The major river flowing through the Kathmandu Valley is the Bagmati.